Home » a town called mercy , bbc , doctor who , science fiction , television » "A Town Called Mercy": Spaghetti western, DOCTOR WHO style! 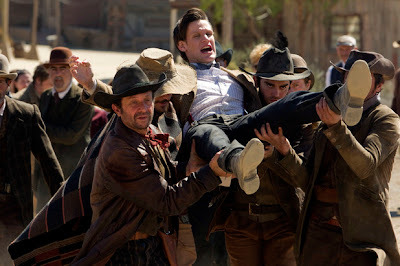 "A Town Called Mercy": Spaghetti western, DOCTOR WHO style! Before getting into the review, I wanna say from the getgo that I thought this week's episode further demonstrates a theory I've had for the past few years: that the Doctor is an unconscious agent of God. Last year's "The Doctor's Wife" might have supported that notion, but I mean, c'mon: how is it that the TARDIS is always landing in a time and place that the Doctor is needed? How else... unless there is a Higher Power guiding the Doctor, whether he is aware of it or not? In spite of the beautiful special effects work (along with the reunion of Harry Potter alums Mark Williams and David Bradley, each of whom turned in fine work) I found last week's "Dinosaurs on a Spaceship" to be somewhat lacking. Maybe that's because it came on the heels of this season's Doctor Who premiere "Asylum of the Daleks", which was a hard episode for any chapter to follow. It's 1870, somewhere in the American west. In the years following the Civil War, the town of Mercy welcomes any and all who are looking for a second chance from their past. Including those who may not be from Earth at all. But the quality of Mercy is threatened: a cyborg gunslinger stalks the outskirts of town. Anyone passing (or who gets exiled) beyond the wooden plank-defined border finds himself prey for a high-tech kill. Of course, the Doctor (with Amy and Rory in tow) finds himself in the midst of it all. I've always thought that the best Doctor Who stories were those which examined and tested the Doctor's morality and ethics. "A Town Called Mercy" is one of those stories. Some might even be reminded of "Genesis of the Daleks", which had Tom Baker's Doctor weighing whether he had the right to commit genocide on the Dalek race before it had a chance to become a threat. "A Town Called Mercy" is a far smaller, more intimate setting, but just as powerful nonetheless. The strength of Matt Smith's performance as the Doctor has consistently been when he's compelled toward the last Time Lord's darker, more guilt-ridden nature, and we see that in spades here. Indeed, the scenes of the Doctor wielding an honest-to-goodness pistol are sincerely striking. Disturbing, even. Look for Farscape's Ben Browder as Isaac, the sheriff of Mercy. And Murray Gold composes a score that truly recollects the westerns of decades gone by. All in all, a very satisfying episode. "A Town Called Mercy" gets 3 and 1/2 Sonic Screwdrivers. And dang nearly 4. Next week: "The Power of Three".